This is why you should cancel plans to watch the Stormers play this weekend and rather go and support Bafana Bafana. South Africa face the Central African Republic in a Brazil 2014 World Cup Qualifier at 8pm on Saturday night. The Stormers are playing a Super Rugby match against the Brumbies at Newlands at 7h30pm. Your stadium experience does not get better than this. Fan Walk, world-class soccer stadium, great surface, noisiest fans you will encounter. Good chance of a crucial victory! Bafana Bafana have only played in Cape Town on a handful of occasions. Their record has been dismal, so you have a chance to witness history, their first win at a crucial time in their upward growth as a team. This is an international match, a qualifier to reach the 2014 World Cup in Brazil. Legends and top authorities on the game are in agreement that he is a better distributor of the ball than any other goalkeeper in the world right now. Whatsmore, he makes blinding saves and is high on entertainment. See ‘Itu’ in the flesh! Coach Gordon Igesund has said that if Bafana get the victory, and if the support is as electric as everyone thinks it will be come Saturday night, that he will bring more games to the Cape in future. You can be part of the solution to see more matches in Cape Town! Two names, in Dean Furman and Anele Ngcongca, hail from the city. Furman grew up in Camps Bay and left at a young age. He now stars in the English lower tiers and has become the cog in Bafana’s midfield. 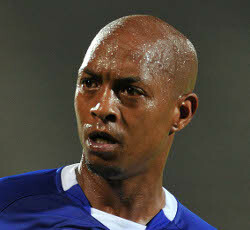 Ngcongca is from Gugulethu and left Cape Town while he still played in the First Division for FC Fortune. He now plays for Genk in Belgium and has played in the Uefa Champions League. I hope you enjoyed last week’s Blast from the Past with Shaun Potgieter. Well, he’s not finished with you yet. Then there was Jigs (Shaun Oliver). Never a dull moment. I still chat with him on BBM and he always had great stories in the dressing room. And my friend Dominic Isaacs – ‘Domza’ was quiet, but he liked money although he would never be in the front asking for money. We had a group of players who would raise issues with the boss on behalf of the players. It was me, Mxolisi Mchunu, Sheppy (Dillon Sheppard), Eddie Dinha and Marciano Vink who used to negotiate for money with John Comitis. I would represent the younger players and be their spokesman. It was eye opening and scary as a younger player because there was a lot of intimidating tactics. But hey John is not a business man for nothing. I mean we always got what we wanted, it was just tough! So we started a fines committee and at the end of the month we would use the cash for a braai or something. Our friend David Kannemeyer always had a chip on his shoulder because of his time with Amaglug-glug and Bafana Bafana … and with his GTI he always thought he was top of the heap! (laughing). He was a typical left back. Not skilful, but he did his work well. We used to call him ‘Complaints Committee’ because he loved to complain. There was Hillary Makasa, that right back from Zambia. I think he had his own tab at the local pub in Summer Greens because that guy could drink hey. He used to say ‘there is only one beer in the world, the one with the only signature in the world – Castle Lager’. ‘Mr H’ – we used to fight. We always took our washing to him because we stayed alone. He used to get cross with me. But in the end we had to get John (Comitis) in to help us. We would throw our kit into the basket in the dressing room, and throw our personal clothes underneath all the kit. He would put it all in the machine and then realise only later and he would get cross hey! But he gave us great life stories because he lived on the docks and never had parents so he has worked so hard in life. Ajax was the first club that we did not have to carry our own boots. Albert used to organise, pack and carry our boots and this was something great for us. I see he is still at Ajax and he even sits on the bench now – I see he got promoted (laughing). You had funny guys like John Lathan and our fitness guy Vlad V – he was crazy. He could get you fit any time though! You had Henk Bodewes. He would make sure that every training session the field was wet, the sprinklers were on at least half an hour before training, always. That is why we passed the ball so well in the early days. We would spend 45 minutes doing passing drills at every session. He used to tell Andile (Sixaba): I can’t believe you are in Bafana but cannot pass the ball just 30 metres. Unbelievable! At Pirates we had Augusto Palacios and also Kosta Papic. We did not get on so well, Kosta and I. Sometimes you just don’t get on with everyone hey! It was my tough situation. The chairman (Irvin Khoza) wanted me, but the coach didn’t so what can you do? But it was very hard to meet with the chairman. Once I waited in the car park for a long time and then he came out so I quickly walked up to his office with him. The chairman said ‘hey you are crazy’. But I just said that I want to play soccer. Then I moved to Maritzburg but co-incidently Kosta Papic moved to the club also. I think I trained for two weeks, but we realised it was not going to work and I moved on. What was your worst payment experience? In the Under 20s with Augusto Palacios, I think it was 1999 or 2000, when we went to the finals of the Africa Youth champs in Ethiopia. What we got promised, I think Safa only gave us half. So we refused to play in a friendly in Alex township and then Palacios, I think, organised those pay cheques quickly and we had our money. The Rothmans Cup bonus in 2000. I think the players got half the money and then they worked it out based on how many games we played. I think it was about R50 000 for those who played most.